Working on Wolf Platform and building applications is not just easy but we can also add surprising functionalities to different elements of the application by setting properties of these elements. Let us begin the journey of making our application more powerful by learning the properties. I will be sharing the knowledge about Properties for different elements during the course of coming sessions on our blog. Today, we will go through the Properties of one of the basic elements of any application i.e. the properties of Application itself. First let us look at the Properties Panel (Figure 1.1). 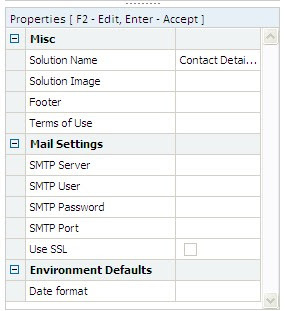 Properties Panel is placed at the Right-Bottom corner of the design console. It reflects the properties which can be set for particular element in the Solution Explorer. The properties panel shows the list of available properties and their existing values (if any in the case of saved elements). Changing the properties of a selected element will change behavior during Runtime. The changes will reflect in available previews only after Save/Publish and subsequent Refreshing of the preview pane. The effects of the changes are explained in the help tab on the left side of the screen. 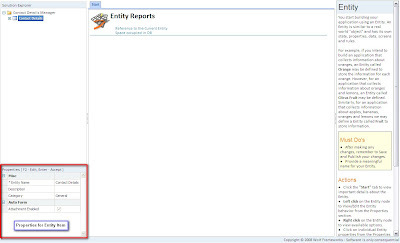 Example, in figure 1.1, Properties for Entity: Contact Details in Solution Explorer is shown in the Properties Window. Each WSF Application solution built on Wolf Platform has few attributes to be set for creating a more informative application. These attributes can be set in the Properties Panel. None of the Properties for application element are mandatory, so one can use the default settings too and build application. a. Solution name: Name your business application and use the "Save" option in the Designer toolbar. b. Solution Image: Select an image that represents your solution best as a logo for your application. c. Footer: Set foot note for your application, such as the copyright symbol and name of the organization. a. SMTP Server: Specify the SMTP server through which you would like to send emails. If left unspecified, all your outgoing emails will go from the WOLF servers by default. b. SMTP user: Specify the SMTP authenticated user. This is required only if your SMTP server requires authentication. c. SMTP Password: Specify the SMTP password for above user. This is required only if your SMTP server requires authentication. e. Use SSL: Specify whether the Server uses SSL or not using check box. Check it if server uses SSL otherwise uncheck. a. Date Format: All dates will be accept data in this date format unless overridden. One can select the format from a dropdown. Format can be dd/mm/yyyy or mm/dd/yyyy. So Friends, after this, now you are ready to start with your solution and tranform it to build a fully functional business application. In the next session, we will go through the properties of other elements of our application.